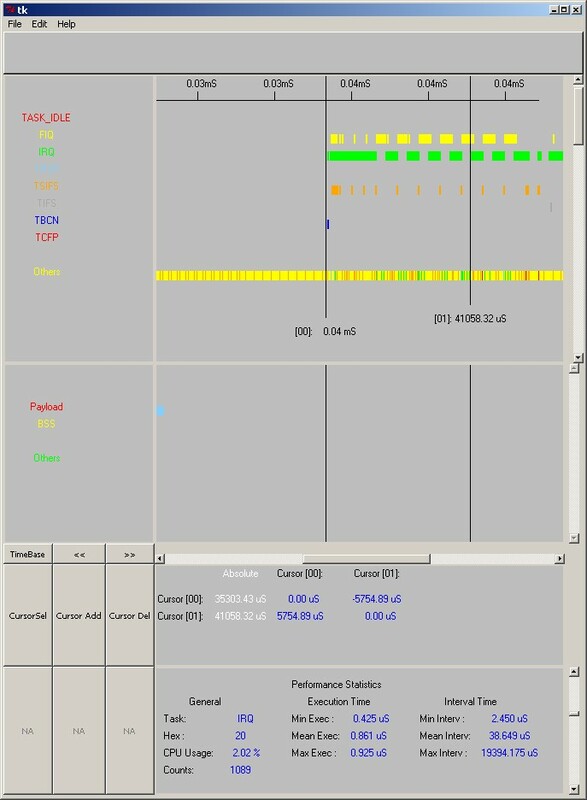 Task analyzer was initially developed as an application script (TCL/Tk) that would read files from Agilent's LA1690, and would display the data graphically. As it was a software development tool, the graphic output weren't signals or busses but instead were bars representing tasks or events. The idea was that at a real time system (a microcontroller), each task or the OS outputs to a hardware register, a word (8 or 16 bits) to a connector where the logic analyzer probes are connected. The user may label the codes with names so when a code of 0x45 is output the display of the LA would print "Task_1" or "IRQ_A" for example. This way the display is more comprehensive. The Logic Analyzer may use asynchronous sampling and store data only on a change. That way large fractions of time are acquired in the LA's memory. Then after full acquisition, the user saves the file in .xml format. This program works after these steps. It loads the .xml file, read the labels, does statistics of each task, and display each task in a different row. 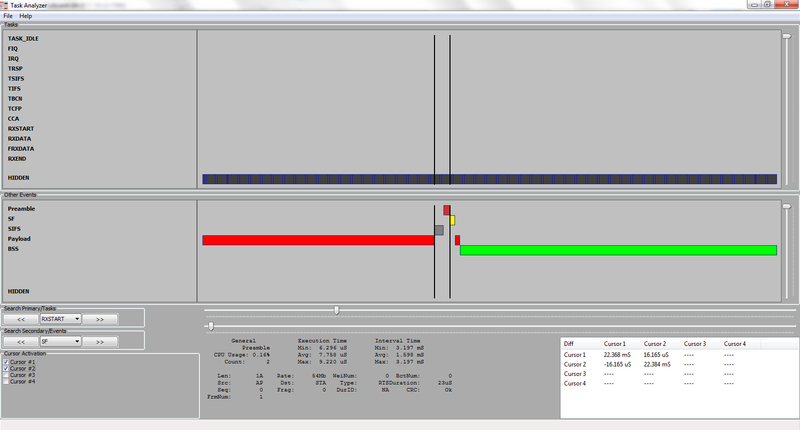 Then the user may add cursors and measure response times etc. Clicking on each execution task prints its statistics in the table below. As this program was primarely used for the development of 802.11ag mac layer, it allowed loading of a second file that represented frames transmitted on the air. The timestamp of each frame was correlated with the internal tasks in the system and thus every detail was known. In general any external event may be recorded and applied as a second file for correlation with the internal system. This program was re-written in Python, and used Tk for graphic output. This was version V2.00. I re-wrote this tool once more time (insane!) in python and wxPython. This is a much more stable release. Check for V3.01. There is also a user guide for this tool. 2. Needed: Logic analyzer with output compatible to LA1690, xml format, or a script to convert the data to XML from your instrument. 3. Needed: A microcontroller hardware, with an output register and clock. 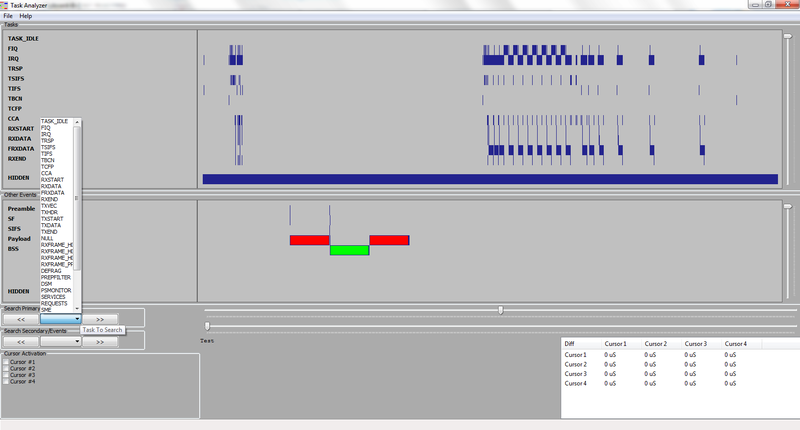 For example you need 8 data signals for byte words and the write pulse of the register. 4. Label at the LA that various action codes to words that are comprehensive (like 0x54: Task_1, 0x23: IRQ_1 etc). 5. Select state acquisition, with external clock. 7. After capturing save the xml file. 9. Load event file if needed. 10. Use TaskAnalyzer for measuring task response times using cursors or check the statistics of each task by clicking on them etc.